June 2018 Trail Bytes: Tortilla Fruit Tarts - Delicious! With the discovery last month of how shredded apples, dipped in lemon juice before drying, tasted great in Bircher Muesli, I was keen to arrange that harmonious marriage of sweet apple and citrus again. When eaten dry, shredded citrus-apples get juicy in your mouth faster than apple pieces. They make a succulent snack while you’re hiking. But why stop there? Let’s make pie, or more precisely, tortilla fruit tarts. Tortillas have long been the peanut butter laden vessel of choice for backpackers. Flexible and ready-to-eat, tortillas make a convenient tart crust – no rolling pin required. If you hanker for a truly amazing treat, pack some foil and matches. 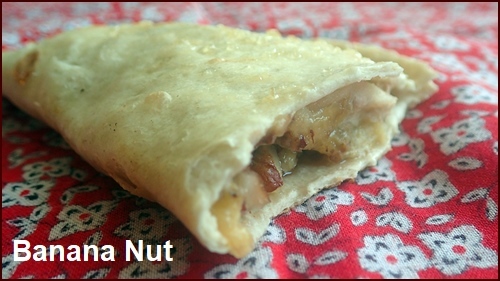 To make small tarts, which is what I made, use taco-size tortillas. To make big tarts, use burrito-size tortillas. A small tart fits neatly in one hand. Go ahead and make one for your right hand, and one for your left. Pack a quarter-cup of dried fruit for each small tart, or a half-cup of dried fruit for each large tart. 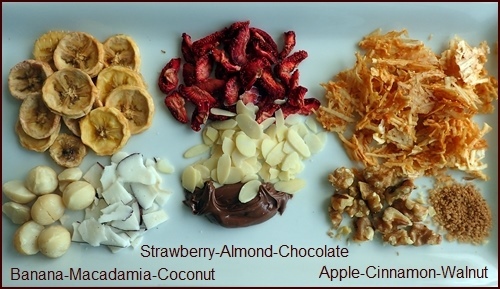 Include a pinch or two of complimentary items like nuts or chocolate as shown in the photo below. At your campsite, place dried fruit in a pot with an equal amount of water, apply heat, and rehydrate the fruit for about ten minutes. You don’t need to boil the fruit, but piping hot is nice. 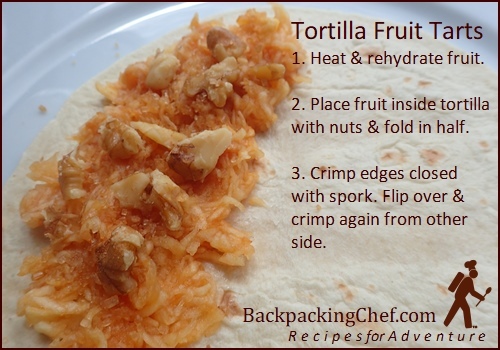 Spoon the rehydrated fruit and any extra ingredients onto one side of a tortilla, and then fold the tortilla in half. Don’t include any extra juices that remain after rehydration, as that will make the tortilla soggy. Crimp the edges of the tortilla with a fork or spork, then flip it over and crimp again from the other side. The seal will hold fairly well, but it may separate just a bit. My crimping skills improved with practice. Worst case scenario, you end up with a tasty fruit taco. Eat your tart with no additional heating, but if you have a campfire or grill with embers remaining after supper, glaze and roast the tart to perfection in under a minute. Photo above: Roasted apple tart with sugar-cinnamon glaze. Highly recommended! To make a glaze, moisten the top of the tart with a dribble of water remaining from rehydration, sprinkle a pinch of sugar and cinnamon over it, and rub it in. Wrap the tart in two layers of foil. Don’t put the foil-wrapped tart directly on the embers or it will burn quickly, and the tortilla will stick to the foil. Keep the glazed side up to avoid scorching. If you don’t apply a glaze, flip the tart over a few times to get a light brown toasting of both sides. You may conclude that glazing the tart with chocolate is messier than necessary, since you’ll already have chocolate on the inside with hot strawberries. Use one of the popular spreads, like Nutella, or try Justin’s Chocolate-Hazelnut Butter Blend, which is available in single-serve packets. Another option is to make chocolate sauce by mixing two to three tablespoons of chocolate milk powder with two to three teaspoons of water. Or, just toss in some M&Ms, but saucy is better. Delicious! 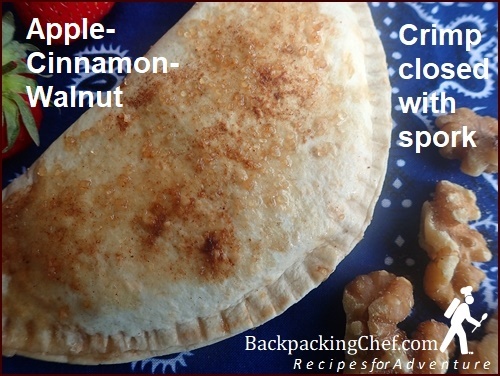 My favorite tart was the shredded citrus-apples with walnuts and a pinch of cinnamon and sugar – on the inside and out. 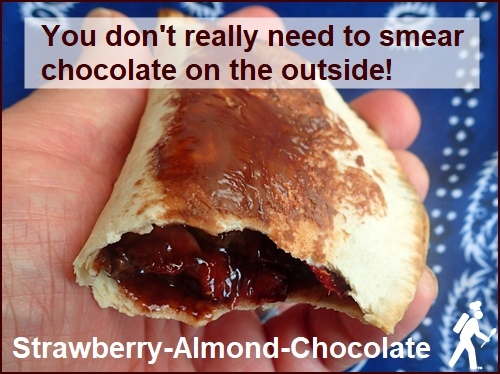 The strawberry-almond-chocolate combo came in a close second. You can’t go wrong with strawberries and chocolate. The banana tart was a little dry with the added macadamia nuts and dried coconut. A second attempt using just bananas and pecan pieces turned out better. I’m looking forward to making more tortilla tarts with rehydrated pumpkin pie bark and sweet potato bark. Dare I consider mini marshmallows for the sweet potato tart? That’s a wrap for this month. See you in July!